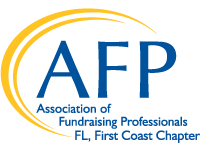 The AFP Florida First Coast Chapter defines diversity as acceptance and respect of individuals of varying cultures, ethnicities, gender, religion, sexual orientation, professional experience, physical ability, opinions and ages. We believe our membership is strengthened by a broad representation of our community, thereby enriching the organizations it serves. THEREFORE BE IT RESOLVED THAT AFP is committed to diversity as a thoughtful, ongoing process in its governance, membership, committees, programs and activities.